Many vacationers consider their vacation incomplete without a visit to a spa. In Las Vegas you don't have to look far. Most mega-resorts offer a health spa complex complete with treatment rooms, fitness center and a salon. Spas are a great idea if you are planning a wedding - the salon can help you get ready for the big day and a massage will make you feel pampered and relaxed. The spa at the Mandarin Oriental is a modern urban hideaway, offering a diverse menu of treatments. Book a couples' massage and enjoy the ultra luxury spa suites which offer an unforgettable experience. The Oasis Spa at the Luxor is open 24 hours and offers treatments inspired by Ancient Egypt such as herbal and aloe wraps in combination with salt sea exfoliation techniques. There is the 50-minute Dead Sea Mud Masque facial, body wraps, body cleansers, facials, and a variety of rejuvenating massages. To book a treatment, call 702-262-5720. The Venetian features the Canyon Ranch SpaClub modeled after the famous Canyon Ranch health resort in Arizona. The Spa at the Bellagio offers a wide array of treatments, including a complete range of massage therapies, facials, body treatments and Vichy showers. The Salon is located in The Conservatory and Botanical Gardens where guests are surrounded by the beauty of the gardens. The Grand Spa and Fitness Center at the MGM Grand measures 30,000-square-feet in size. The Spa at New York-New York Casino offers a fitness center, men and women's steam, sauna, whirlpool, and hydrotherapy tubs. Services include aromatherapy massage, clay body masks, sea salt body scrubs, and more. The Spa by Mandara at Paris is a 25,000 square foot Balinese-style health and beauty retreat. Vacation at the Monte Carlo hotel which offers 259 luxury suites, a spa, tennis club and a wave pool. The Spa Suites at the Monte Carlo feature a full-size spa tub with a view, wet bar and Italian marble bathrooms with a separate wet sauna. The Spa at Monte Carlo offers an intimate atmosphere featuring furnishings from around the world. Stone from India, marble from China, ceramics from Indonesia porcelain from Italy, and granite from Saudi Arabia create a relaxing setting.Guests can also work out at the fitness center. The facility is open daily from 6am to 9pm. Guests must be at least 18 years old to enter the spa and fitness center. There is a $22 per day fee for hotel guests to enter the spa and fitness center ($25 for non-guests). The fee provides access to the steam room, sauna, and hot and cool whirlpools. Guests receive spa clothing, including robes, t-shirts, shorts and sandals for use at the spa. There is a TV lounge, and complimentary fruit juices are served throughout the day. Relieve your tension and recover from stress at the Spa at Mandalay Bay Resort, a 30,000 square foot complex offering treatments and exercise facilities. 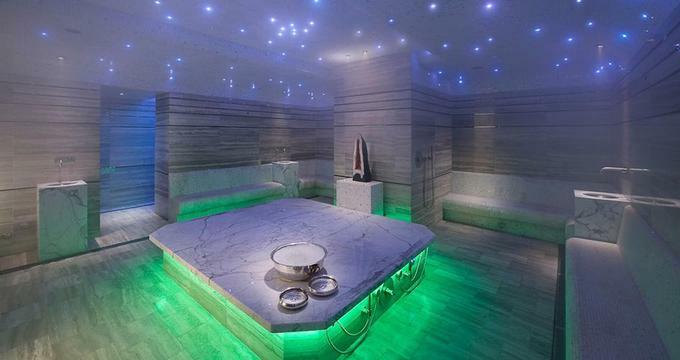 Pampering areas include the Eucalyptus steam room, the hot dry sauna, or one of the hot, warm, or cold plunge pools. The facility overlooks the resort's tropical lagoon to provide a relaxing environment. Services include massage and aromatherapy treatments with influences from various cultures around the world. Robert Cromeans Salon offers a variety of professional beauty treatments. The interior is furnished with oak cabinets, brass fixtures and stone floors. Guests can relax and indulge in several lounges and juice bars which offer an exotic array of fruits, snacks, and beverages served throughout the day. In addition, full-service spa cuisine is available throughout the day. Venus The Salon at Caesars Palace and the hotel spa provide a place to relax and enjoy a massage, a facial, or a therapeutic scalp treatment. Excalibur is for medieval enthusiasts and, thanks to its 13,000 square Royal Treatment Spa & Fitness Center, for spa fans as well. This oasis of tranquility offers a range of facials, massages, body wraps and specialized treatments. If you just want a serene place to relax, entrance is $15 for hotel guests and $20 for non guests, per person per day. Facilities include a Sauna, steam room, heated whirlpool, relaxation lounge and an exercise room. Opening times are from 6 am to 9 pm daily. Guests must be 18 or older. Treatment reservations can be made up to seven days in advance by calling 702-597-7772. Do the Spas Offer Packages? You can find many deals and hotel packages in this fun city. Plan a trip from one of the West Coast cities, or stay for a whole week. The "Luxury Breaks" package at the Mandarin Oriental includes a daily credit from $75 to $150 which you can use on treatments at the luxury wellness center. Here are the details: A daily dining or credit of USD 75 per day, or USD 150 if you reserve a suite, a Minimum two-night stay required. Bally's is offering the "Classic Relaxation" special from just $135 per night which includes: 1 night stay in a classic room at Bally's, 1 treatment (Swedish Massage or European Facial), 1 access pass and a 10% discount on retail items. Mention Offer Code: PKGBST2. The "Spa Experience Package" at Aria includes: Deluxe King Room, Two Classic Massages, Two Classic Facials, Personalized Aromatherapy Bath, Complimentary Champagne and Chocolate covered strawberries – in Suite and Two – One Day Passes. The Sun and Spa at the Trump includes 15% off your room, 20% off a cabana and 20% off a classic Trump massage when you book all three together. The Wynn is offering up to $200 in Resort Credit which you can use to enjoy some well-deserved pampering at the. The longer your stay, the larger the resort credit, as follows: Book a 2-night stay and get a $50 resort credit, Book a 3-night stay and get a $100 resort credit, Book a 4-night stay and get a $150 resort credit and Book a 5-night or more stay and get a $200 resort credit.